This blog post is brought to you by my iPhone. 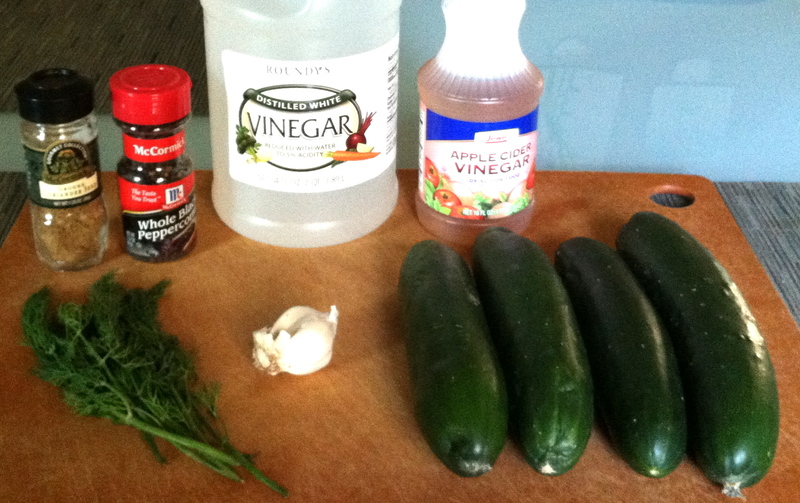 Thankfully, my phone camera is pretty great and I was able to document this pickle making extravaganza. 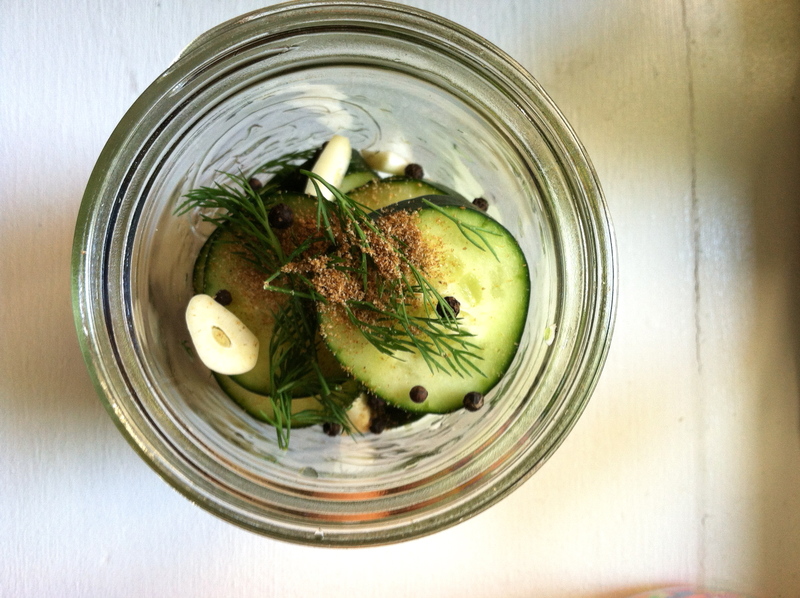 Pickles are in my top 10 favorite foods and I can’t believe this was my first time making them. The thing about canning is that you have to be patient. Truth is, I don’t know if these are any good yet! Tomorrow I finally get to crack open a jar and see if they turned out OK…so stay tuned and assume no news is good news! 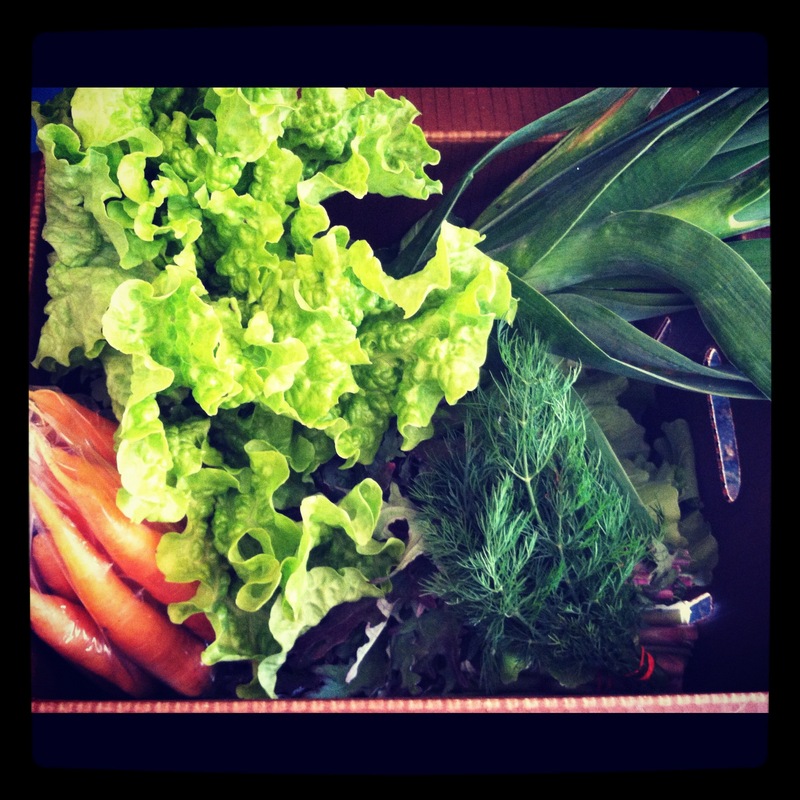 Mikey and I joined a CSA (community supported agriculture) from Growing Home, a local organic farm that delivers bushels of fresh vegetables around Chicago. The produce is primarily from the Les Brown Memorial Farm and they are doing amazing things throughout the city and providing fresh produce to those who can’t get it. 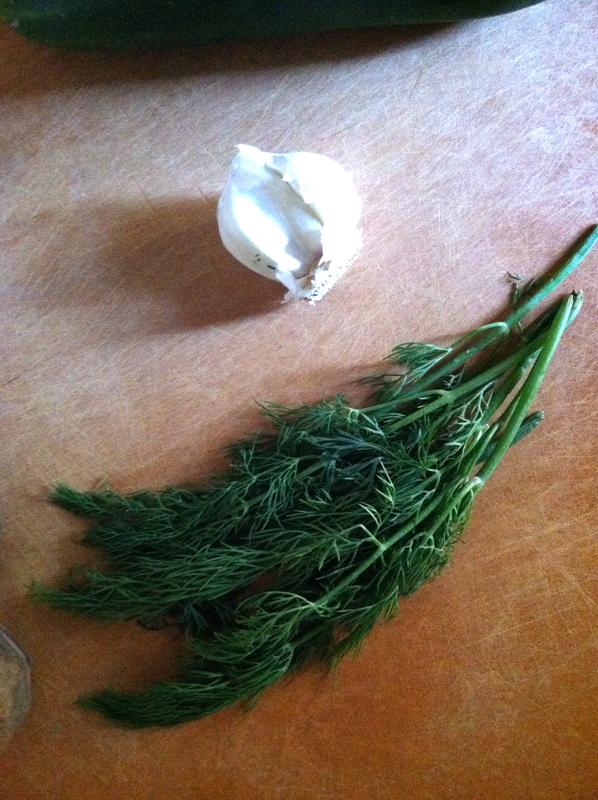 Our first bushel included a ton of fresh dill, so pickles were an obvious choice. 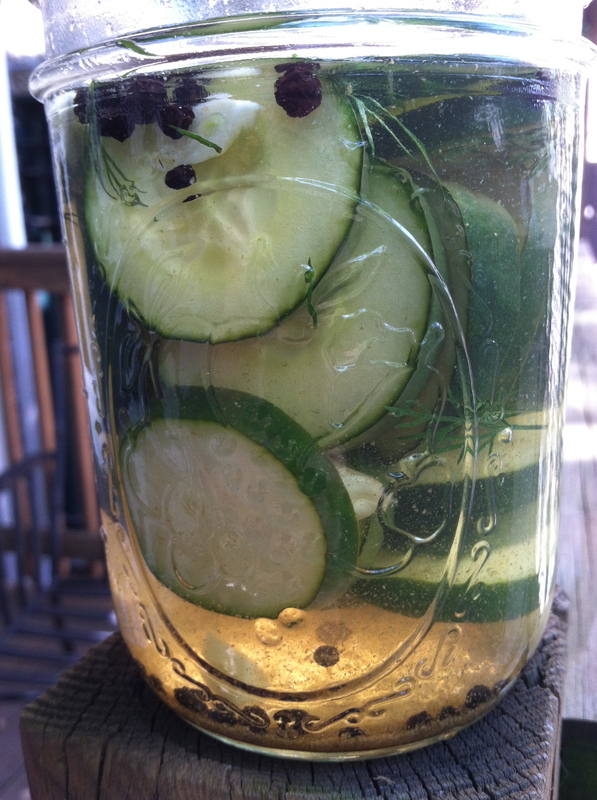 Vinegar, cucumbers, some spices and water. These pickles are juuussttt about ready to be opened. 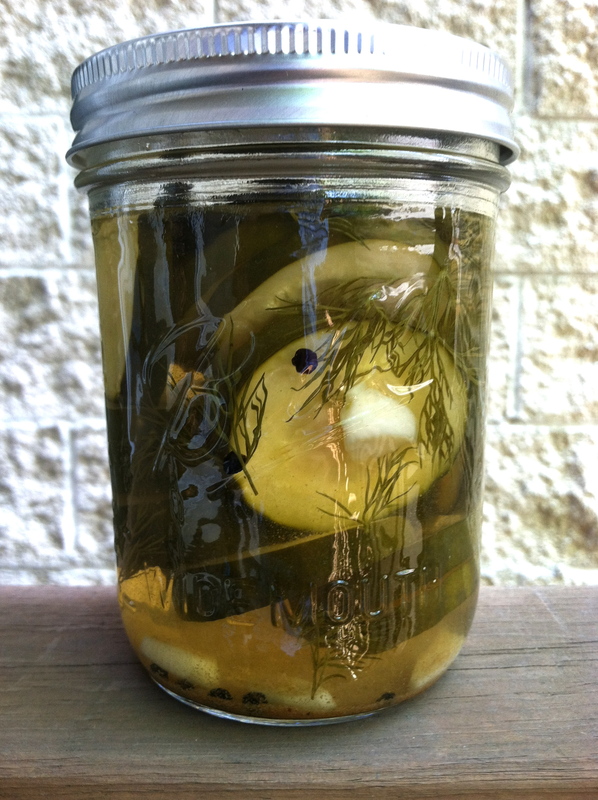 Do you have a go-to pickle recipe that you love? 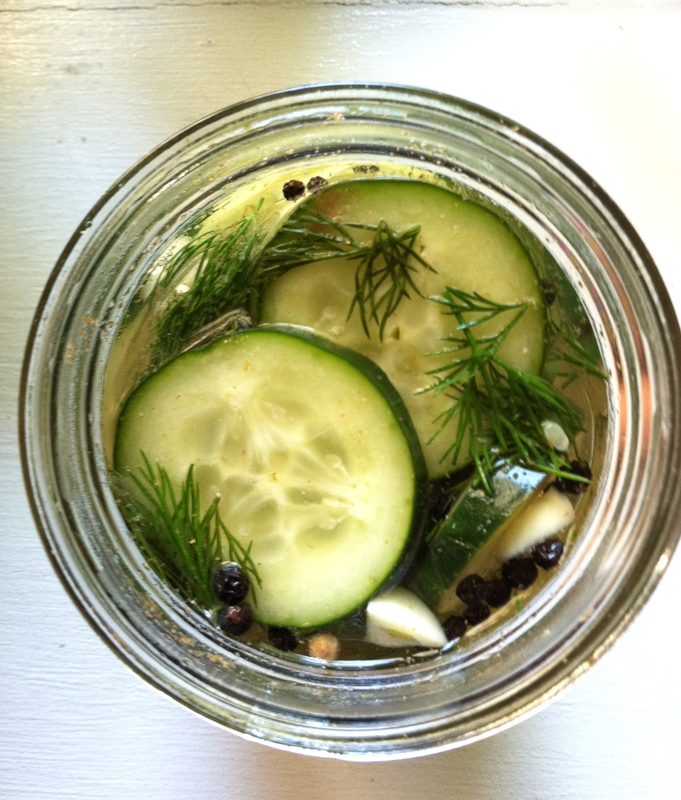 I am in the beginning stages of my pickling and canning and would love any input or advice on how you make yours! Hope you are all doing well, I apologize for the sparse posting lately. We are headed to Germany for awhile…so this is going to be my last post for a bit…I will miss you! Can’t wait to share my pictures of all the beer, sausages and adventures we have! Combine vinegars, water, sugar and salt into a medium saucepan and bring to a boil. 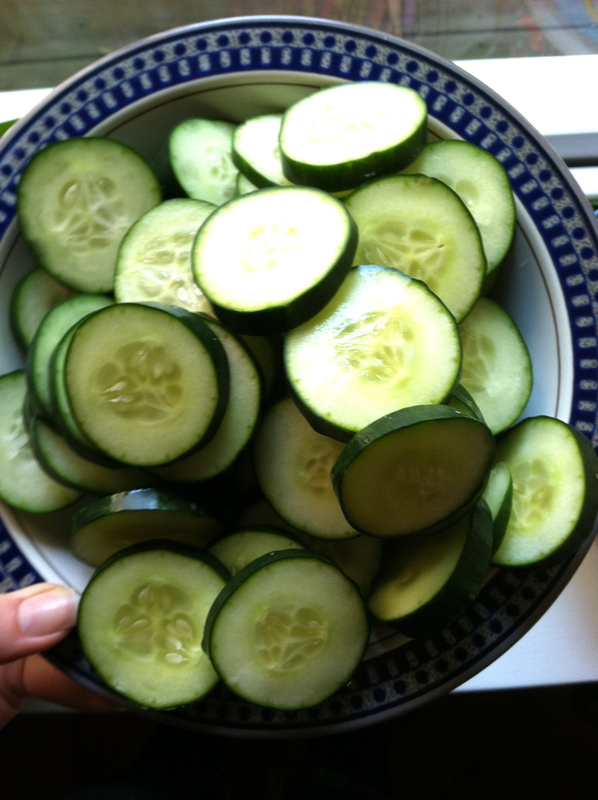 Wash and cut cucumbers into sticks, slices or spears. 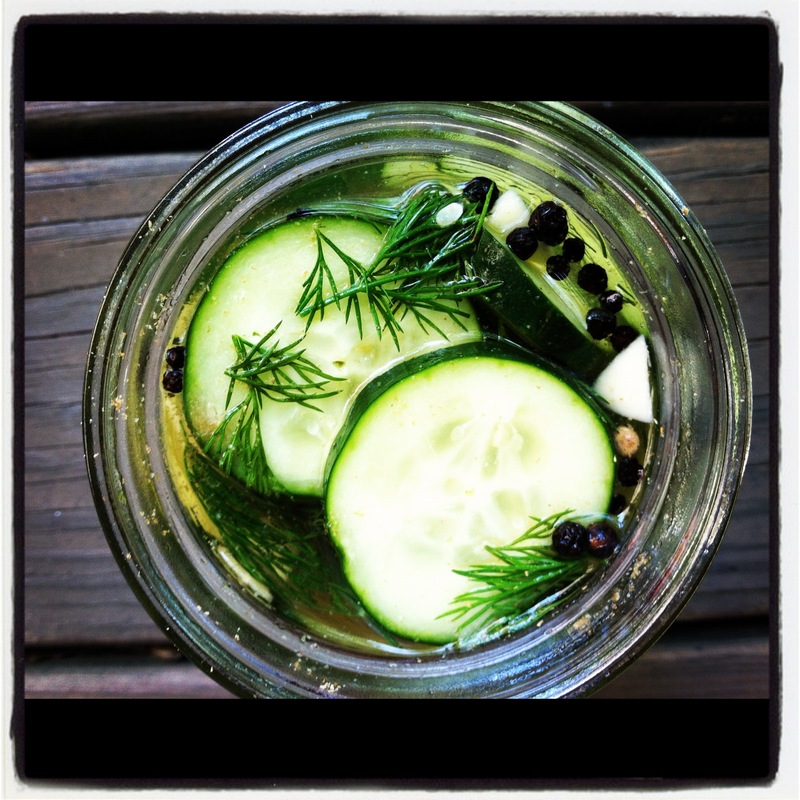 Wash 3 canning jars (more or less depending on what size you use) and place sliced cucumbers into jars. 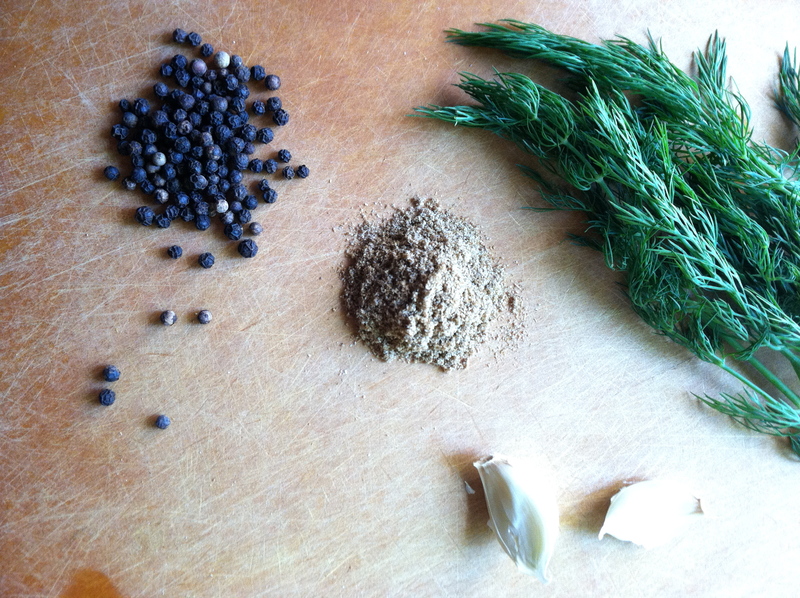 Evenly distribute garlic, peppercorns, dill and coriander between the jars filled with cucumbers. Once the vinegar mixture has boiled, remove from heat and add to jars. 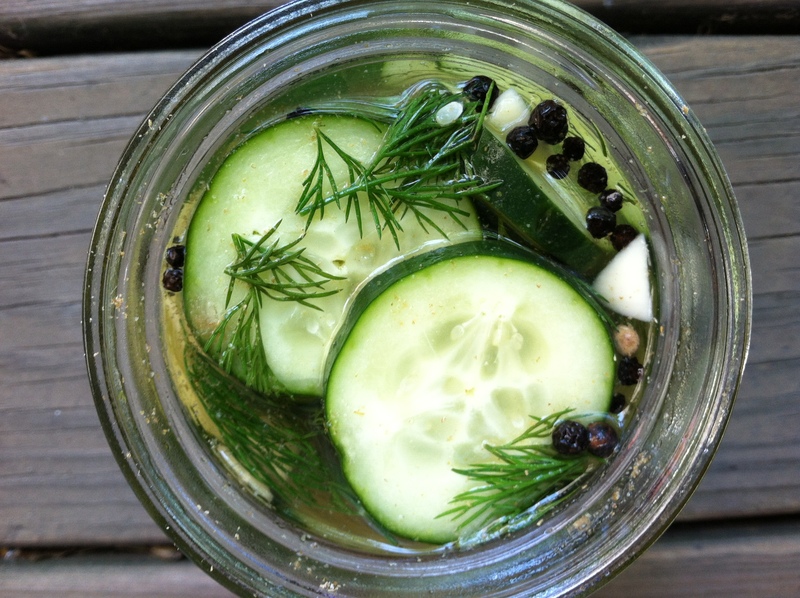 Place lids on jars and let sit on the counter for at least 3 days and after three days place in the refrigerator. 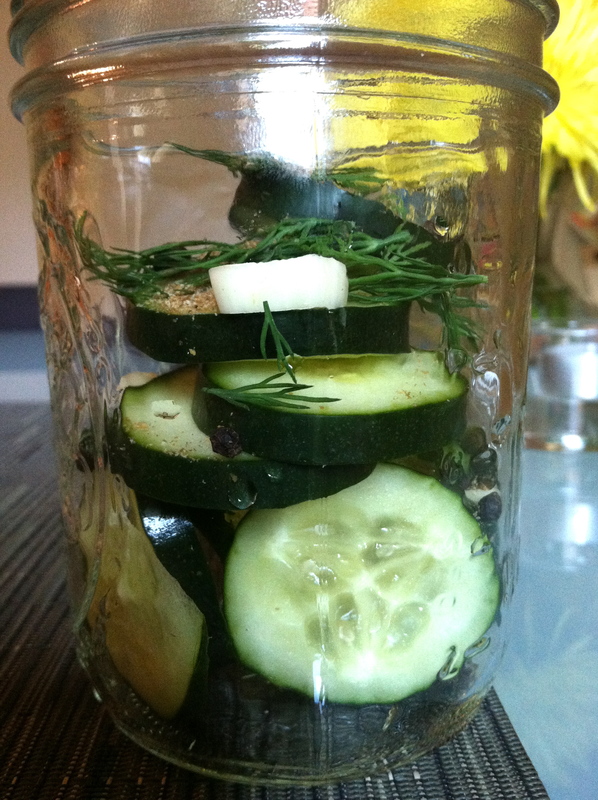 The longer you let the pickles sit and absorb the better!